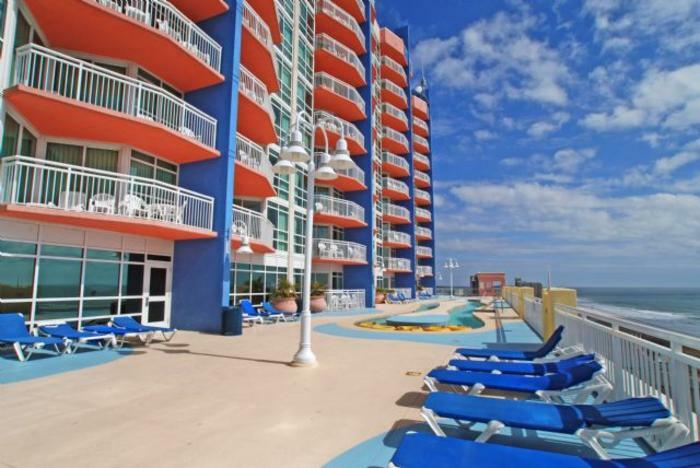 This prestigious North Myrtle Beach resort is located right across the street from the beautiful Atlantic Ocean. Having the white sandy beaches so close to your North Myrtle Beach vacation rental means you can go to the beach for an afternoon, an hour or a minute because getting to and from the beachfront is a breeze. Prince Resort II is located in the Cherry Grove section of North Myrtle Beach, SC, an area with a reputation for quiet beaches that are family friendly. The accommodations at this North Myrtle Beach resort are terrific and of a high quality. Don’t settle for less when you can have exceptional lodging at a renowned North Myrtle Beach resort and at a great price. This North Myrtle Beach resort stands out from the crowd with warm colors on the exterior that are so inviting and welcoming. The first eight floors of this North Myrtle Beach resort are the convenient parking garage. Then on top of the parking garage is 11 stories of North Myrtle Beach vacation rentals, each with an ocean view balcony. Pull into Prince Resort II, which is easy to find from Highway 17 in North Myrtle Beach, SC and take the elevator or use the stairs if you are just a floor or two away from your North Myrtle Beach rental. The hallways in Prince Resort II are enclosed so you can go from the parking garage to the front door of your North Myrtle Beach condominium and keep out of a rain shower. This high-rise North Myrtle Beach resort stands tall on the North Myrtle Beach landscape so that from your private condominium in North Myrtle Beach, SC you can easily see the Atlantic Ocean or the salt marsh. A fishing pier is right across the street from Prince Resort II so there is much to watch from the balcony of your North Myrtle Beach condo rental. You have the perfect seat for either an oceanfront sunrise or a salt marsh sunset at these condos in North Myrtle Beach, South Carolina. Elliott Beach Rentals is not affiliated with onsite management or the HOA of Prince Resort Ii.